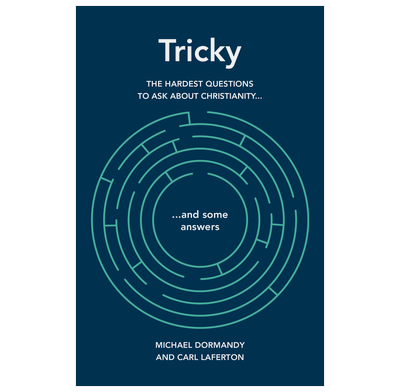 Answers nine of the hardest questions about Christianity in an engaging, biblical and straightforward way. This book does not try to sound clever, or win an argument. It does aim to to introduce people to Jesus and the answers he gives to the hard questions we ask. Many Christian young adults and teenagers have hard questions about their faith. Many non-Christians do, too. Michael and Carl take nine of the hardest, such as "Doesn't Jesus ruin your fun?" "Why is there so much suffering?" and "What does Jesus really think about being gay?" These aren't questions with easy answers; but, as they show, they are questions that have good answers. Written for people of all backgrounds and beliefs, it's a book that is short but not simplistic, and clear but not condescending. If you are a Christian struggling with these issues… if you want to have confidence to talk to your friends about these things… or if you are a non-Christian who wants answers to the hardest questions you can ask… grab this book. 1. Doesn’t Jesus ruin your fun? 2. In the end it’s just a matter of opinion, isn’t it? 3. How can anyone believe Jesus rose from the dead? 4. If Jesus is real, why is there so much suffering? 5. Does Jesus care about my pain? 6. Hasn’t science disproved God? 7. What does Jesus really think about being gay? 8. Surely you don’t think there’s only one true religion? 9. Why should I bother with Jesus? We used 'Tricky' to prepare a short series focussed especially on equipping our young people with succinct, biblically faithful and engaging answers to some of the common questions their friends ask them. Our youth leaders benefitted from the book as a starting point for preparing sessions and our young people especially were helped by the chapter on suffering as they had been asking lots of questions about this during the previous term. We'd wholeheartedly recommend it as a resource to give away to young people. Biblical, really clear and manageable chapters on a wide range of topics. We're using it in our Christian Union at school and find the material very helpful. Good balance of personal anecdotes and the facts. Highly recommended. I read and reviewed this book for a summer camp - I challenged the young people to buy the book, read the chapter addressing the question(s) they had, and chat to a leader during the week. The succinct chapters and clear writing make this an easy read so a manageable task for the campers! The authors seek to address the questions (including 'Doesn't Jesus ruin your fun?' and 'What does Jesus really think about being gay?') by going back to the Bible, and the gospels in particular, which really cuts to the heart of the issues, and helps move away from conjecture and discussing 'the church' and its position. The writing style is honest and engaging - especially with difficult moral questions. And the authors are ready to challenge readers to take Jesus as his word. I would say that for anyone who has done some reading or thinking on a particular question, this book may not have enough detail. But for anyone wrestling with these issues for the first time, this is a brilliant book. And for all of us seeking to answer questions from others, this is a hugely helpful resource. I bought two copies of this book, one for a young teenage girl I am close to, and one for my grandson. I liked immediately the look (and feel) of the book, I thought it would appeal to young people. Naturally I read the book first before I passed it on and found it to be very very good. The subjects it tackled were just right for young teens today, particularly for the two young people I gave them to. Each have grown up in Christian homes and each going through the "teenage angst" years. Each chapter was honest, relevant to the people it is aimed at I would say, with a good-turn-of-phrase. It was also written in a caring way, I liked that. Thank you SO much for having a heart for young people today. It is not an easy world out there!! With very best wishes.